Excavate the site and construct the footing. Locate the corners of the wall on the footing. Dry-lay the first course of blocks, leaving space for the mortar. Snap a chalk line to mark the position of the blocks on the footing. 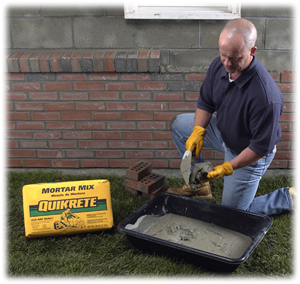 Pick up the blocks and spread a full bed of QUIKRETE® Mason Mix or Mortar Mix on the footing. Use a trowel to furrow the mortar. It is important to have plenty of mortar along the bottom edges of the block for the first course. Position the corner block carefully, with the thicker end of the face shell up; all blocks should be laid this way to provide a larger mortar bedding area. When handling a block, always tip it slightly toward you so that you can see the edge of the course below. Place several blocks on end and apply mortar to their vertical face shells. Push each block down into the mortar bed and against the previously laid block. Joints should be about 3/8″ thick. After three or four blocks have been laid, use a level to check for plumbness and correct alignment. Make any adjustments by tapping the block with the trowel handle, and then complete the first course. Make all adjustments while the mortar is still soft. Any attempt to move a block after the mortar has stiffened will break the bond, weakening the wall and allowing moisture to penetrate. With the remaining courses, mortar is applied to the horizontal face shells of each block; for the vertical joints, mortar either the previously laid block or the block to be placed, but not both. As each block is laid, cut off the excess mortar with a trowel. When laying the remainder of the wall, the corners should be built first, usually 4 or 5 courses at a time. As each course is laid at the corner, it should be stepped back a half block. Check for plumbness, alignment, and horizontal spacing of the blocks. To fill in the wall between corners, stretch a mason’s line from corner to corner and lay the top outside edge of the blocks against it. When placing the course block, all edges of the opening and all four vertical edges of the closure block should be buttered with mortar. Make sure all joints are tight and weatherproof. Work the joints after each section of the wall has been laid, and mortar has partially hardened. Proper tooling procedures uniform joints with sharp, clean lines. Tool the horizontal joints first, and then work the vertical joints with an S-shaped jointer. Wood plates can be fastened to the top course. Use ½” – diameter, 18″ – long anchor bolts in the cores of the top 2 courses, no more than 4′ apart. Fill the cores with mortar, making sure that the bolts extend a few inches above the top of the wall. We recommend mixing QUIKRETE® Mortar Mix and QUIKRETE® Mason Mix for this project. 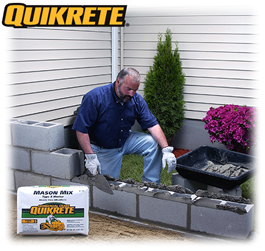 Use QUIKRETE® Heavy-Duty Masonry Coating to waterproof both above and below the grade line.